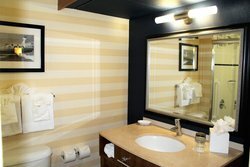 Here to match your needs, our handicap accessible rooms are equipped with grab bars near the toilet and in the fully tiled roll-in shower. Shower seats are available upon request. Rest easy in a comfortable king bed with plush bedding and host additional guests on the sleeper sofa bed. 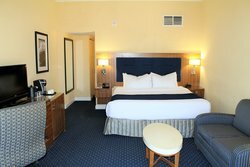 This spacious king room comes with modern amenities such as complimentary Wi-Fi, a 32” flat-screen TV with HBO, and a mini-refrigerator. Relax on the sleeper sofa to watch a movie or check your email inbox at the dedicated work desk. Our accessible accommodations are ideally located at the downtown Hampton waterfront.